As mentioned in the About Me page, till now I have paid for 2 software which I thought were really worth the price. One was for the Flickr Pro account using which I could archive and share “GB’s” of photos. Its probably the best photo sharing/management application that I have come across. The other application that is worth paying is Mint. 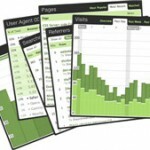 Its one of the best web analytics software out there and also one of the best looking application as well. It provides real time visitor data and being a self-hosted application, it gives you complete control over your analytics data. As of now I track/read around 70-80 RSS feeds everyday (unlike Scoble who manages to go through 622 RSS feeds :)). One thing which will ease this task is a powerful RSS reader. Somehow I am not comfortable with web based RSS readers including Google Reader. 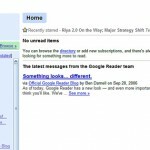 I was on a lookout for an ideal Desktop based RSS reader from quite some time. After evaluating FeedDemon for around 30 days, I had shifted to RSS Bandit, which I thought was a good alternative to FeedDemon. One of the feature missing in RSS Bandit is the synchronization of RSS feeds. (Web based readers have an edge here). So If I happen to find some free time at my workplace and read some of the feeds, they are synchronized when I access FeedDemon at home. FeedDemon uses NewsGator to synchronize the feeds. So you have an added advantage of both an Desktop and Web Based RSS reader with FeedDemon. FeedDemon has an amazing user interface;its a pleasure reading feeds on FeedDemon. There are lot of options to customize the reading view and it also has powerful filtering and searching capabilities. Which RSS feed reader do you use ? Do you prefer Web Based or Desktop Based Reader ? 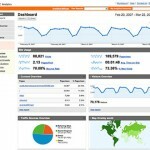 Do you think its worth paying for an RSS feed reader ? If yes, which reader would you recommend ? MeasureMap – What ever happened ? Well, my all time favourite is Google Reader. But I’ll definitely give FeedDemon a try. It’s the best desktop feed reader out there. I’ve seen many positive reviews about it. Venu, even I am thinking of buying feed demon. Currently I am using feedreader 3 since it does not offer sync with web based readers I am thinking of opting feedreader. I may buy that soon, BTW how much does that cost? Yup Google reader is famous among geeks and such. Try feedDemon you will definitely fall in love with it. Shiv, it costs around 30$ and I remember trying FeedReader also after you recommended that. Thanks for blogging about FeedDemon, Venu – glad to hear that you like it! I love the google reader, but its slow at times when I access it with a temporary dial up….never tried a desktop based reader….i am looking at firefox extentions these days…. Anand, Irrespective of dialup or broadband, Google Reader is sluggish. You can’t navigate between multiple feeds quickly. Firefox extension.. hmm me personally wouldn’t like bloating up my browser (in fact there are many extensions out there I guess). Hmm…I prefer to use the Live Bookmarks for the easiest access….i started using the reader only since a lot of people suggested it….now that you have suggested another one….I might as well test it out! I am using Google Reader and I am pretty happy with it. I think the initial version of Google Reader had lot of issues, but the current one seems to be fine. There is an occasional “unexpected error”, but its not too frequent to motivate me to look out for a change. And I am almost always connected to the Internet, so I dont have the need to get the content on the local machine and read them “offline”. Is there anything really worth (in terms of features) that Google Reader lacks drastically compared to FeedDemon? Frankly, I feel that it doesn’t make too much sense to pay for a RSS reader when there are really good free readers available. Even in case of desktop readers; Feedreader, Greatnews and Snarfer offer sync options. Greatnews and snarfer can sync with Bloglines, while feedreader offers sync thru’ file transfer (FTP). Awasu also offers similar sync options. I use Jetbrains Omea Reader for my feed reading. It is as powerful in terms of features as the best readers out there, but doesn’t offer sync facility. This is a drawback, but if you don’t use two systems to access feeds, then it is worth giving a shot. I reviewed Omea sometime back and it was also on the top of the list of RSS resources compiled at Mashable. Vasu, Google Reader is not bad, but it doesn’t suit the number of feeds that I read and the application is not scalable I feel. In Google reader, everytime I click on a feed, it takes some time to load. Partly I have to even blame the broadband connection. In US its pretty fast I believe. I can’t say for sure if Omea is written in Java or not, but it doesn’t state that as a requirement. (requiring Java to run). Maybe I should try Feeddemon and then start comparing it with Omea, but at the moment I am really happy with Omea. If you like web based RSS reader you should try: http://www.itsmynews.com. I used to use google reader because it had been my homepage, but i like itsmynews much better. For one i think the layout is cleaner, and i think they have better features. They have a site of the day that i think it cool, and they also make it really easy to share feeds you like with your friends. Personally, I think FeedDemon is a ripoff. Hey Venu Try Rss Bandit its almost similar to FeedDemon. Plus its Free I have more than 300+ Rss Feeds. It great if you are a power feed reader like me. Arpit, I did try RSS Bandit as well, (after feeddemon trial expired) but I don’t know, there was something unique/nice about the FeedDemon UI, which dragged me back to FeedDemon.